Here is a short Windows 8 tutorial on how to run apps as different user from the Start Screen, in Windows 8. In the older versions of Windows 8, you could just hold ‘Shift Key’ and click right on the application in order to use it as a different user, however it’s the other way here in Windows 8. Lets check out how to run Windows 8 app as another user from the Start Screen below. Before that, also check out our post on how to skip tile interface and boot directly to desktop. Firstly, you need to open the run box. So, press ‘Win+R’ combination to open the box. Type gpedit.msc and press ‘Enter’ key. Now, click on ‘User Configuration ? Administrative Templates ? Start Menu and Taskbar. Now, double-click on Show ‘Run as different user’ command on Start given under the ‘Settings’ column. Just switch from ‘Not Configured’ to ‘Enabled’, and click ‘Ok’ to save the settings. Now, to execute and to get the action into existence, you need to take the policy. For this, open the run box again (press ‘Win+Run’ key combo). 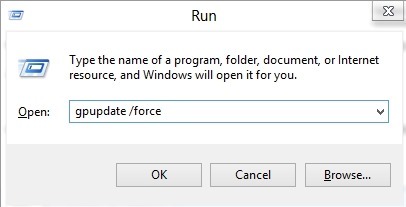 Just type gpupdate /force in the run box and hit ‘Enter’. Its done, now you can run Windows 8 app as another user from the Start screen. 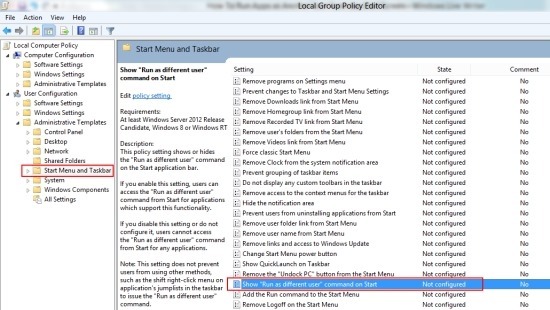 Go ahead and follow the above given steps to run apps as different user from Start Screen now..